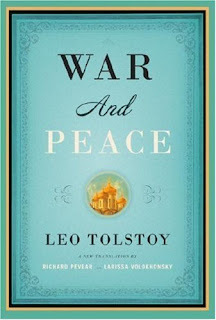 My version of War & Peace is divided into four books, and I have completed the first book in a little less than a month. Not bad, as my assumption was that it would take me the entire year to finish this approx 1475 page behemoth. I'm nearly 400 pages through, now and I am enjoying every second of it. The book contains war details and what is happening on the home front including diplomatic elements, duels and practical jokes. Someone once told me there were two types of writing - one that tells an element or a few elements of a story or topic and one which tries to explain everything over a time period. Tolstoy has been renowned for the latter, and I must admit to being completely scared about this type of writing before starting the novel. Now, I am completely absorbed and all I want to do is take a month off of work and read it non-stop. I have had to do a little bit of external research on the Napoleonic Wars, and I must say that I am FASCINATED by the history. My general impression of Napoleon was always of a little man with a lot to prove due to his stature, that won a few battles for France. I had no idea the magnitude, and I'm really starting to appreciate his military mind. In historical terms, book 1 deals with 1805, which is essentially the War of the Third Coalition with France on the one side, and Russia/Austria on the other. The General at the time on the Russian side was Mikhail Kutusov (Emperor = Alexander I), which I have somehow developed an attachment to as I read. The General became a scapegoat for a lot of the Russian losses in the battle of Austerlitz despite some of the incompetence of other Russian leaders (according to the book) in developing a game plan for the battle. And of course, most of the Russians blamed Austria as well... and it's quite possible that the reverse is also true. Anyway, I just loved reading about the battles in 1805 and I am incredibly impressed with Tolstoy. I am seriously considering reading some other epic works after War & Peace, because at least in this case, the length (keep in mind I'm only 400 pages in) seems to be completely justified. I have been reading other works in between, and I find this takes me away a little from the story. 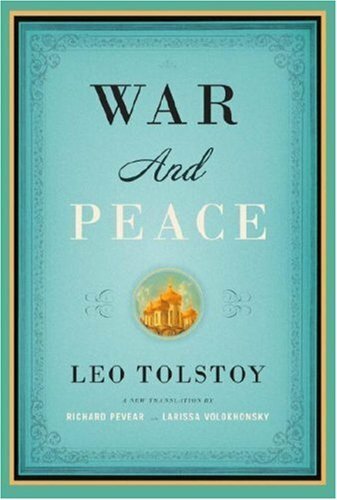 I believe if you're going to read works concurrently, make sure you don't leave War & Peace for any extended period of time and then try to pick it back up. Just my advice for some of the rest of you who are currently completing War & Peace challenges. The names are a little distracting, but I have an edition that I believe simplifies this somehow without changing the text. 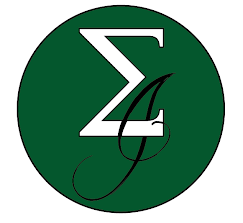 I'll post the translator eventually, but the book was published by 'The Folio Society', a publisher I have 99% confidence in (how can you really have 100% confidence in any publisher? :) The main characters are often referred to (I guess this is the definition of a main character), but I still find myself forgetting whom did which during what time. Tolstoy refers back though, and I find this helps me out a lot. For those in my book club and in the general blogging world, WITHOUT SPOILERS, please let me know what you're thinking of the work so far. I read W&P in 2009, and everyone reading it now is making me want to experience it all over again. I read it over a 2-week vacation and do think that it was better for being uninterrupted reading. I was surprised to find it so interesting and easy to read. I'm glad you are enjoying it! Your review is likely making everyone who hasn't yet read W&P breathe a collective sigh of relief. This makes the book much less scary of a journey to tackle! I'm glad the review gives you hope... because if you ignore the sheer length of the work, it turns out it's not that daunting. Not to mention that the good from this book far outweighs the issue of length. From my experiences, a shorter work like 'The Sound and the Fury' by Faulkner or even the really short 'Utopia' by Sir Thomas More are more daunting an experience. I'm about 43% of the way through now (according to my kindle) I am loving it the more I read as the characters are now quite imbedded into my brain whereas at the beginning there were alot of them. I'm about 115 pages in and really like it so far. I need to do more research on the Napoleonic wars. I can follow along without, I think, but like you, I'm curious.